That could also provide a theoretical basis for successful CEOs in search of attractive, young and fecund trophy wives. Of course, nothing is risk-free. The trophy wife and the gold digger may not be interested in DNA at all, although that would greatly upset the theoretical models of our learned evolutionary psychologists and anthropologists. The problem with such theories is that they lack experimental evidence. This is not solely the fault the scientists. How do you run such an experiment? You ask a woman why she ditched her student boyfriend and married the CEO of a Standard and Poor’s 500 company? The answer to that is so self- evident that any other answer could be part of a study on hypocrisy. Or perhaps you analyze their DNA to see if indeed it is likely to yield a superior baby? Of course we know that children of college educated parents have, on average, a higher IQ, are more likely to go to college, and are more likely to garner better jobs and higher salaries. But all those can be purely a function of environmental influences, with little or no genetic contribution. So how do we test the role of genetics and natural selection in this mating game? Fernando Mateos-Gonzalez and his team at the Natural History Museum of Barcelona, Spain, studied the behavior of siskins (Carduelis pinus), a beautiful little bird (see picture). 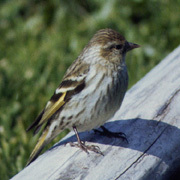 Pine Siskins are small, streaked, yellow-tinged finches. Males often have yellow wing-stripes and tails, although the yellow is highly variable. Females of this species are known to pick males on the basis of the length of a yellow on the wings of the male bird. In an experiment described in the April 2011 online edition of Biological Letters, the researchers challenged hungry males to unlock a cache of pine seeds blocked by toothpicks. And who do you guess was best at solving the problem? The handsome guys with the long yellow stripe, of course. Other confounding factors, like age, size and social dominance as contributory factors were ruled out. The investigators conclude that fancier feathers might help discerning females to select mates that are not only sexier, but also smarter. Which confirms suspicions that I have been nursing since puberty: some guys have it all. And you people telling dumb blonde jokes –think again. They may be smarter than you are, evolutionarily speaking of course. As JFK famously quipped: life is not fair. Dov Michaeli, MD, PhD is a basic researcher, blogger at The Doctor Weighs In.